Suspected Rhino Poacher Killed By Elephant, Eaten By Pride Of Lions Park officials said all that was left at the scene were "a human skull and a pair of pants." Many on social media have called the incident karma. Officials at Kruger National Park in South Africa said a suspected rhino poacher was killed by an elephant and his remains eaten by lions. Pictured here, an elephant in the park in 2016. A suspected rhino poacher was killed by an elephant and his remains likely eaten by a pride of lions, park officials in South Africa said. Kruger National Park rangers received a call last week from the family of the suspected poacher, the park said in a statement issued Friday. 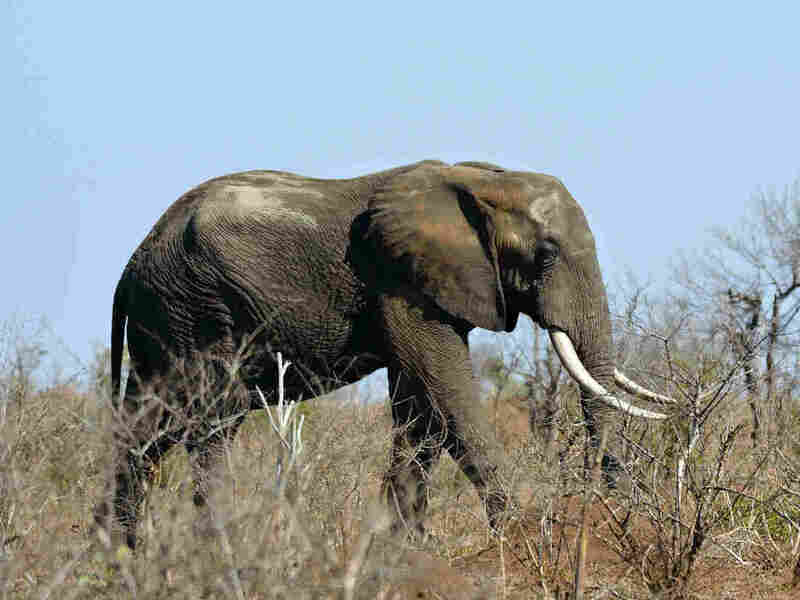 According to the family, accomplices of their relative said he was killed by an elephant on Tuesday, while they were in the park to poach rhinos. The elephant attacked "suddenly," police Brig. Leonard Hlathi told South African news website TimesLive. Hlathi said the man's accomplices claimed to have carried his body to a road before leaving the park. Rangers began search efforts to find the man's remains and bring the family closure but could not locate a body. "Indications found at the scene suggested that a pride of lions had devoured the remains leaving only a human skull and a pair of pants," the statement reads. The remains were found in the Crocodile Bridge section of the park. Observers were quick to point out the apparent irony. "It's the Circle of life," one commentator quipped on Twitter. Glenn Phillips, managing executive of the park, issued his condolences to the deceased's family. "Entering Kruger National Park illegally and on foot is not wise, it holds many dangers and this incident is evidence of that," Phillips said in the statement. Police are investigating the incident, and the other four suspected poachers have been arrested and will appear in court, according to the statement. It's not the first time animals have killed a suspected poacher in South Africa. Last year, one was attacked and eaten by a pride of lions in Limpopo province, police said. The number of rhinos poached in South Africa has trended down since 2014, but demand for the animal's horn, nonetheless, remains strong, Reuters reports. More than 500 rhinos were poached for their horns in the first eight months of last year. Kruger National Park, South Africa's largest game reserve, covers thousands of square miles along the country's northeastern border. As of late last year, the park had some 5,000 rhinos, down from around 9,000 in 2014, according to government estimates cited by Reuters. Poaching and drought have both contributed to the decrease. Last year, South African Minister of Environmental Affairs Edna Molewa called rhino poaching "a national priority crime." In a statement, she said that more than 500 alleged poachers and traffickers were arrested in 2017, with the majority of arrests taking place inside or around Kruger National Park.